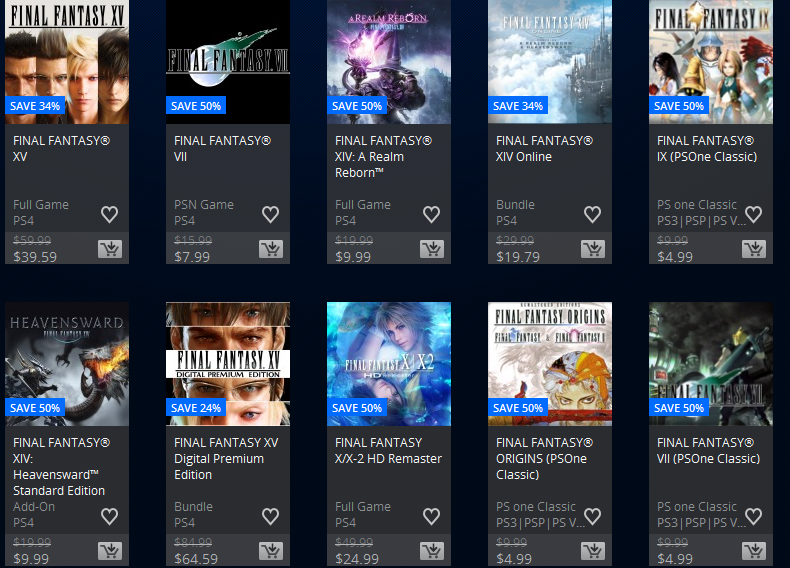 The North American PSN store is having a Final Fantasy sale on right now. This is your chance to pick up Final Fantasy XV if the normal price tag is a bit too steep, or maybe you want to get some old classics or try some you haven't played before! Think you'll be picking anything up? For those of the more PC gaming persuasion, all of the FF titles on Steam (which is most FF titles period) are on sale as well for 50% off at the moment. What's the Digital Premium XV? Even on sale it's more than the normal game. So who would get base XIV over a Realm Reborn especially when the former costs more? When you7 look closely, it says "bundle", and under Final Fantasy XIV it says, in tiny letters "A Realm Reborn" and "Heavensward", so it's the base game and the expansion bundled together. The OG FFXIV isn't even supported by SE servers anymore, so it's not playable.